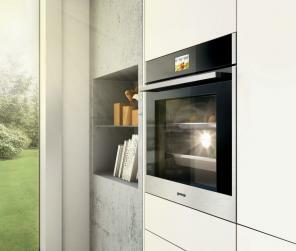 Cooking appliances are the heart of the kitchen. Ovens, perhaps, are the most technologically advanced appliances offering a number of functions, programs and other technological innovations which all are created for one main purpose - perfectly cooked and crispy dishes. 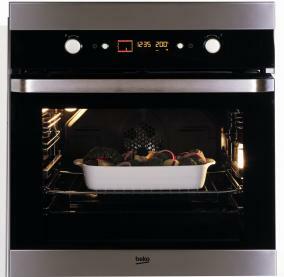 Easy door cleaning: nano technology used in domestic ovens ensures dirt resistant. Cool door: the number of glass layers, heat reflection, effective door isolation increases quality of the oven operation, reduces energy consumption and prevents users from accidental burns. Meat probe: precisely monitored and controlled meat cooking process. Odour free cooking: thanks to special odour filtering systems, unwanted food odours will not be spread throughout the kitchen during the cooking process. Frying kit: regulary roating and using only a small quantity of oil you perfectly fry potatoes, nuts or pop corn. Pyrolysis: the inside surface of the oven and in some cases cooking trays and wire shelves are covered with special pyrolitic enamel which is high temperature resistant. Oven is heated up to 5000C during the pyrolitic cleaning process. In such conditions dirt simply burns even in the most difficult to reach corners and when the self cleaning process is over the ash of dirt can be simply wiped with a piece of cloth. Smoothly closing door: easy movement is enough for soft, elegant and silent door closing which will not disturb the cooking process and cunsomer. Quick pre-heating: all heating elements are activated at the same time and the required temperature for cooking is reached in a shorter period of time. Multidimensional cooking: lower, upper and fan heating elements work simultaneously to provide the most even heat and temperature distribution. It is possible to cook up to three dishes at the same time without mixing odours or aromas. Telescopic pull out shelves: enables easy and safe access to the cooking tray. 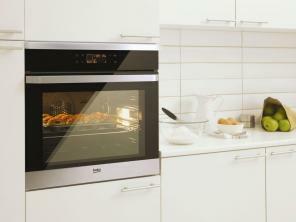 Smart features: ovens with full color TFT LCD screens. Programs and functions are selected simply sliding the screen which provides simple and clear settings also logical menu choices. All the cunsomer has to do is to prepare ingredients of the selected dish as required in the screen and press start button. It will also be very easy to find frequently used programs and settings.